Over the last few years I have tried to learn from my fellow enthusiasts and on more than one occasion their ideas have been borrowed. This particular project started with a trip to my local garden centre in Chessington where they have a fantastic pet and aquatic centre. Whilst picking up some guinea pig food I noticed out the corner of my eye several sheets of cork bark. Some in slabs others in tube format (old trunks I assume). 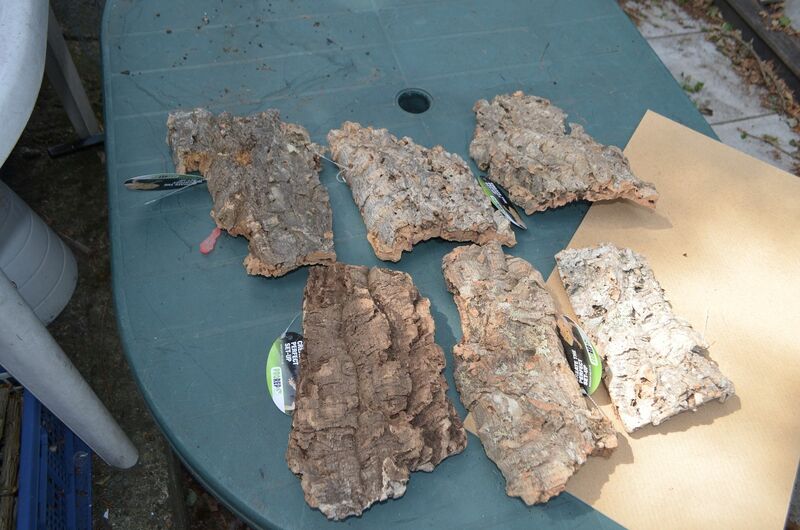 These are used as decor in reptile tanks. Up and til now I had never been able to source this material and having seen some fabulous mountainous and cliff terrain using this material I decided to go for it. Interestingly the smaller pieces (measuring around the size of an A4 sheet) were retailing at £2.99 in comparison to the big tubes/slabs at almost £30. 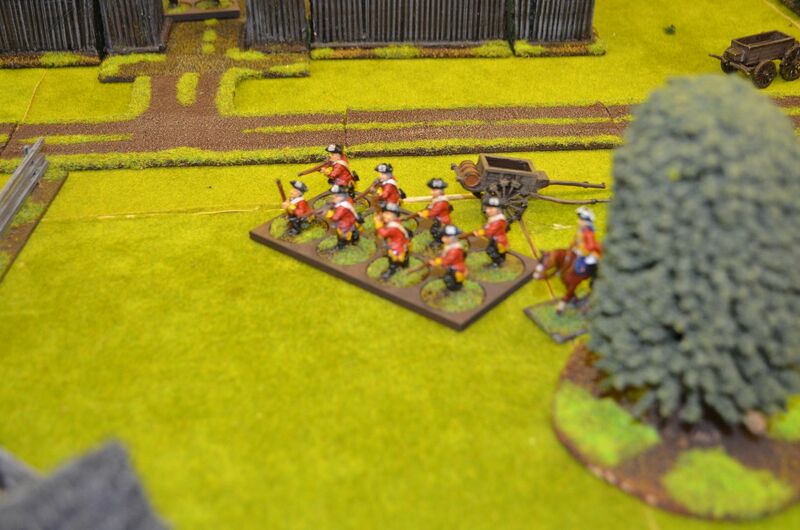 I decided that the smaller ones would support my purpose and six pieces went into the trolley. Once home I looked closely at my new purchase. The Bark is ridged and fortunately the ridges run along the long side. Clearly to turn these into something was going to take a bit of imagination and some practise. 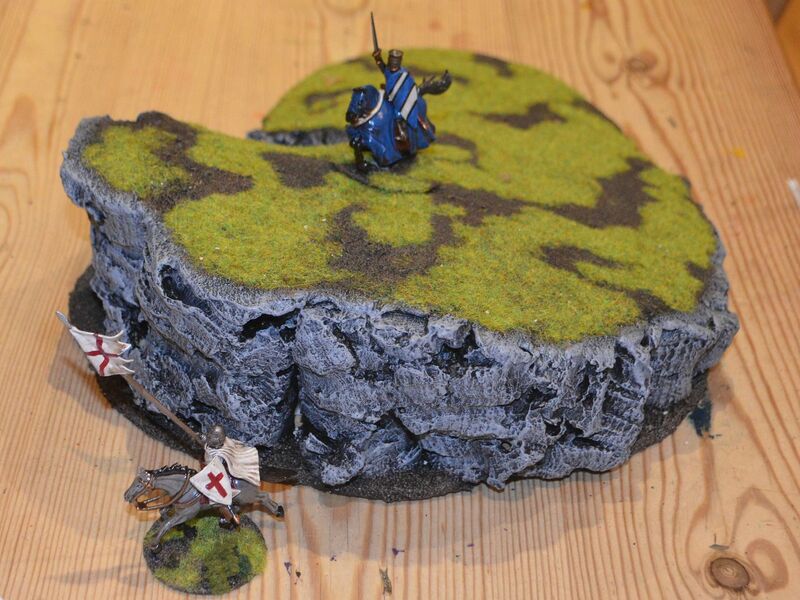 I decided a small rocky outcrop would be a good start. Taking a piece of hardboard I cut out a curved shape that was about 20cm by 30cm. 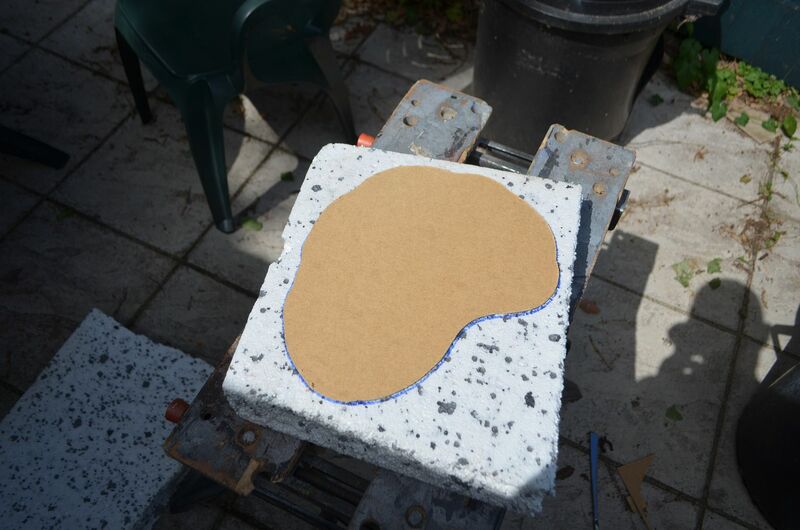 I then placed this shape onto a slab of thick polysterene and copied the shape. 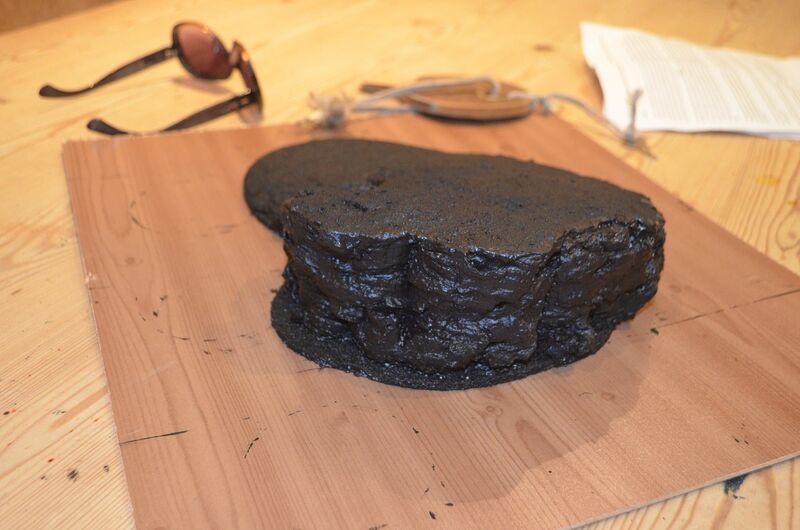 Using my trusty foam cutter the shape soon emerged from the slab. A sheet of bark was selected. The bark slabs have a gentle curve to them so using this I marked out in permanent marker the height of my cliffs that would run half way round the outcrop. The bark was then cut with a simple wood saw. I was concerned that it might crumble with all this handling but my fears were allayed as this stuff is actually quite tough. Lining out the cut sections actions the polysterene I began to cut away the excess foam so the bark cliffs would sit against the form and on the baseboard. 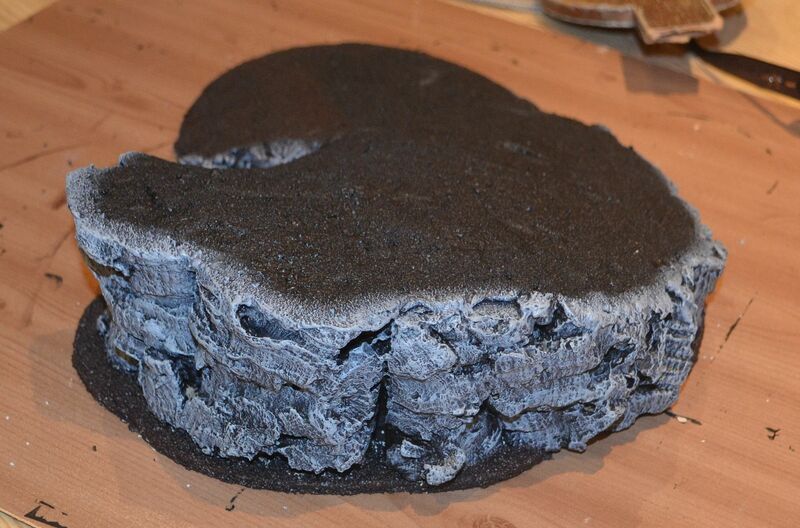 Once satisfied the foam and the bark were glued (PVA) to the base. 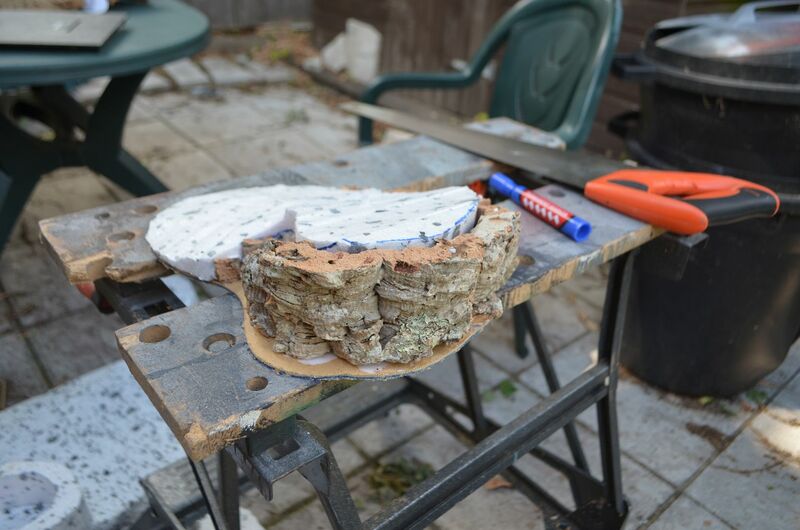 To add further strength to the construct I drilled holes in both the board and the bark and pushed through glue covered skewers to hold the whole lot together. The next morning found the unit totally dry. 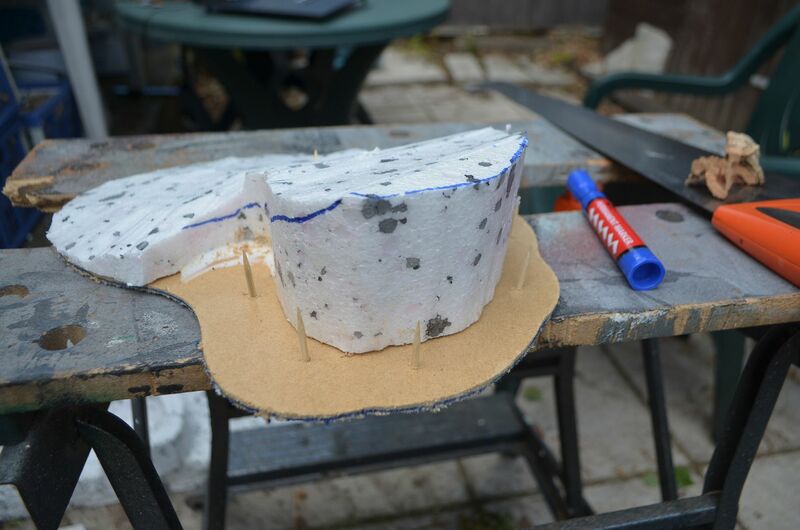 Using some off cuts of polysterene I packed the gaps between the cliff face nd the polysterene hill. 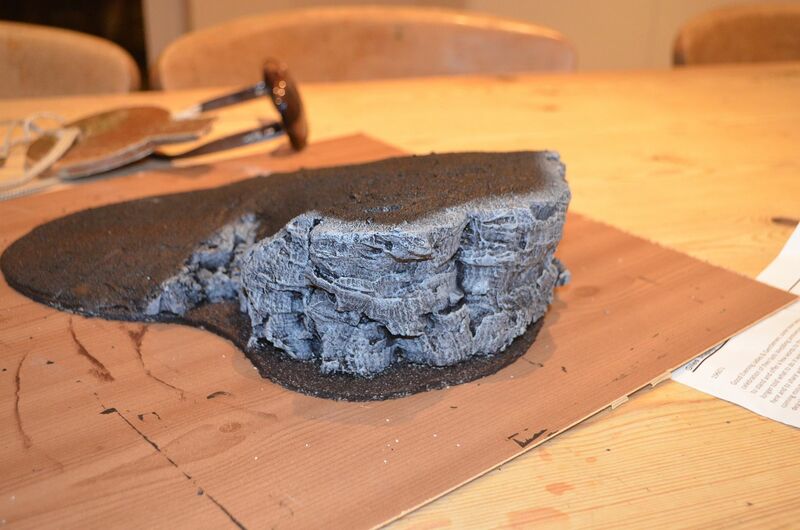 Once done I took out the sculping foam cutter and began to smooth done the reverse slope of the hill. It was all starting top look very good. Next up I slapped filler all over the surface of the hill giving it a nice top strong coat. Once dry the plaster was standed to a relatively smooth finish. 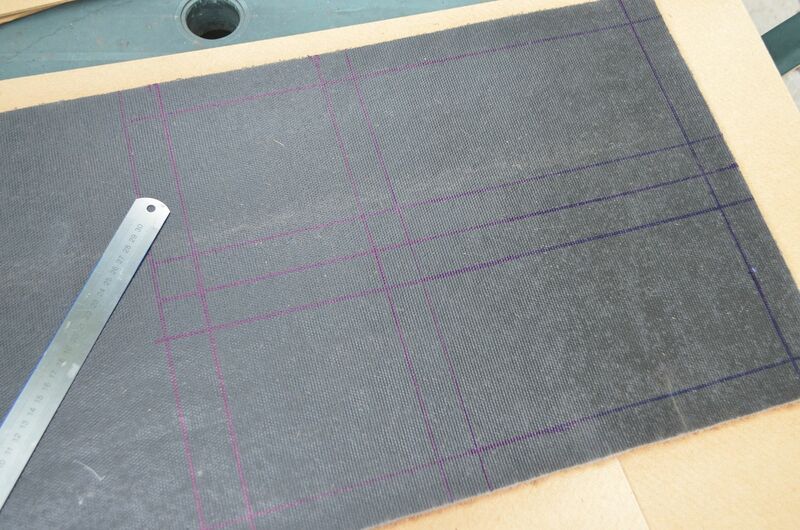 TIP: I found a pack of five sanding blocks in the local pound shop – much chearer than the usuial sheets I buy. Sorry forgot to take a picture here. 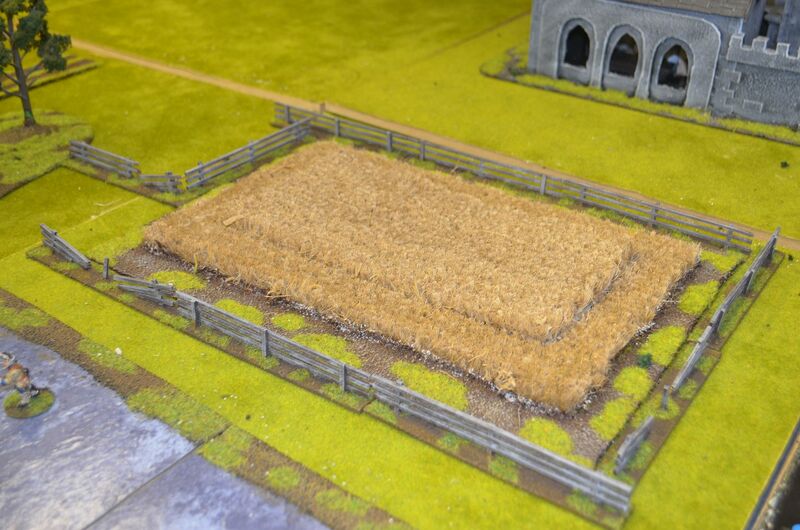 Once the whole lot was dry, I then covered the surface in fine ballast and again let this dry. By doing these simple five minute jobs at either end of the day kept this project moving. Now the exciting part ! 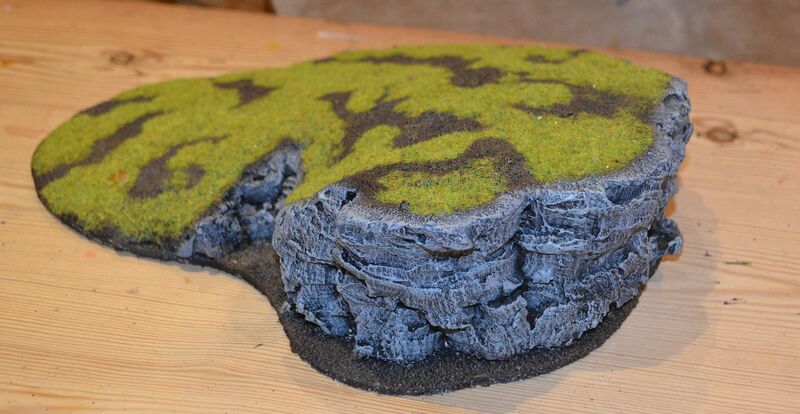 Would the cliff face work? 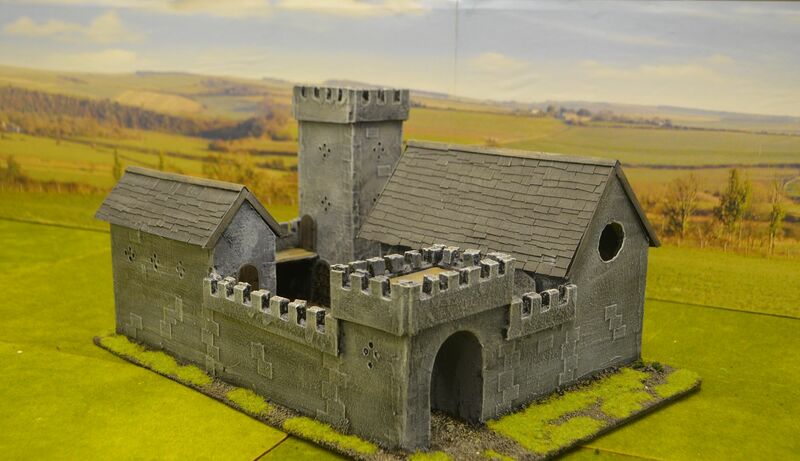 Well judging from these photos I am really pleased with the effect once the cliff face has been dry brushed various greys. although I have to say I will be using this approach from now on. 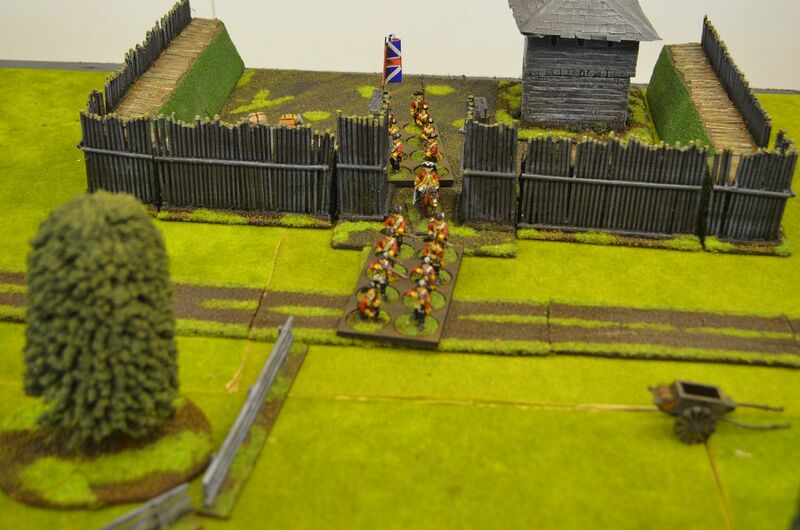 I built a solid on board on which half of the run could be mounted (this allows me to move this round the battlefield) and I just wanted to take some pictures to share. 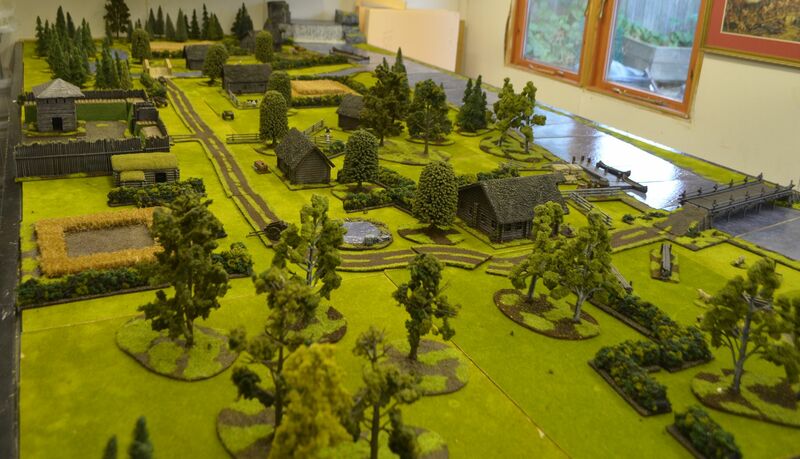 This shows the board 1.5m long and 30 cm high on the table - really pleased how the grass works ! 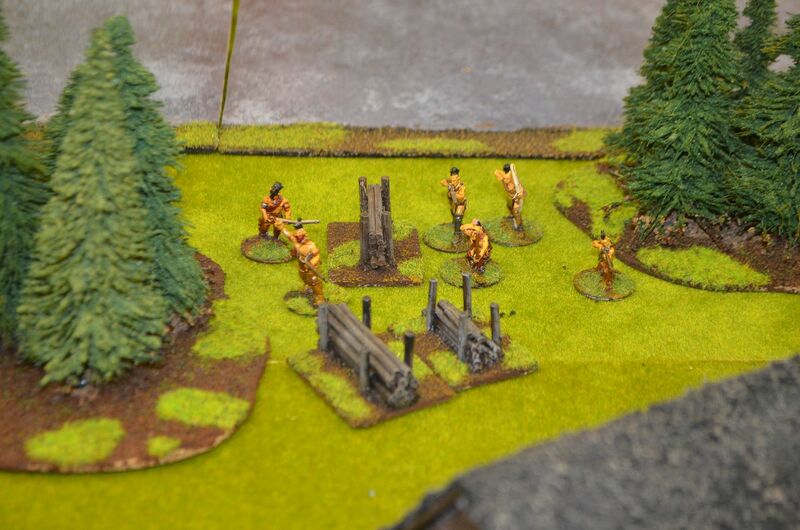 With the Saga games taking the focus of attention in the past few weeks I decided that we’d have a change on Monday night and revert back to a good old game of Muskets and Tomahawks. 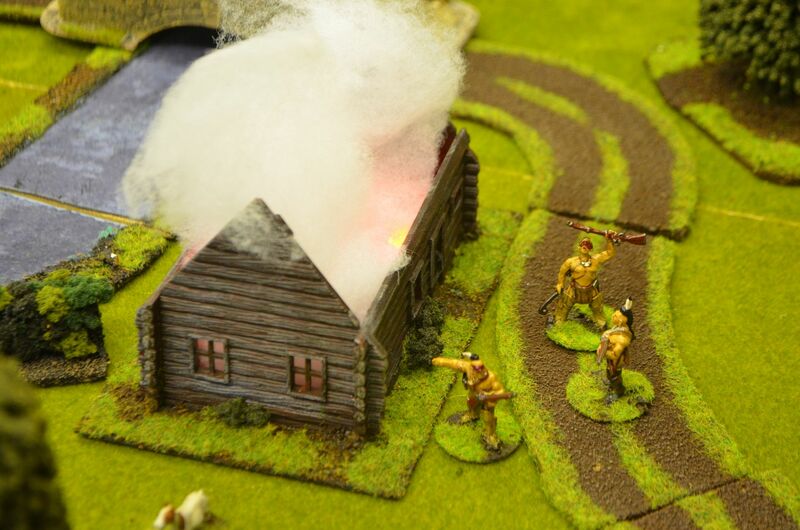 Given the three players had not played the scenario (run at last years BLAM) and that I’d never done a write up of this adventure I thought it was a worthy game for the evening. 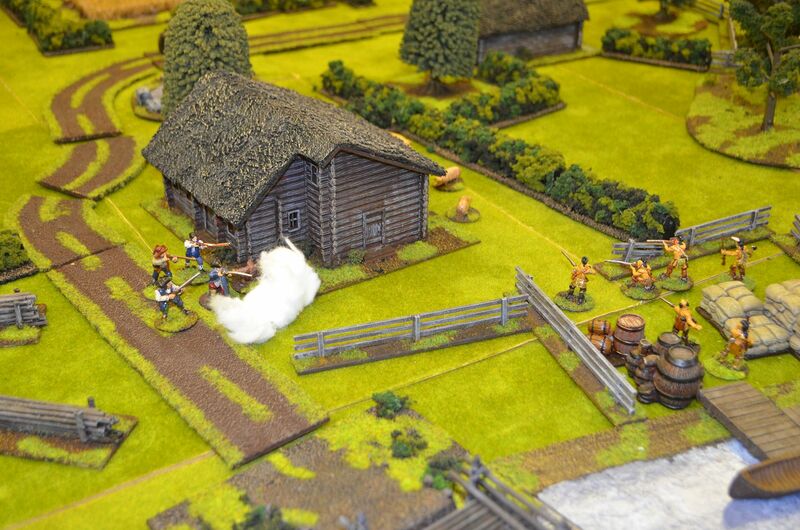 Our scenario is based on the Canadian Frontier at the height of the French Indian War. The local Huron chieftain is coming to the end of his days and has decided that amongst his warriors the bravest , richest and smartest should be his worthy successor. 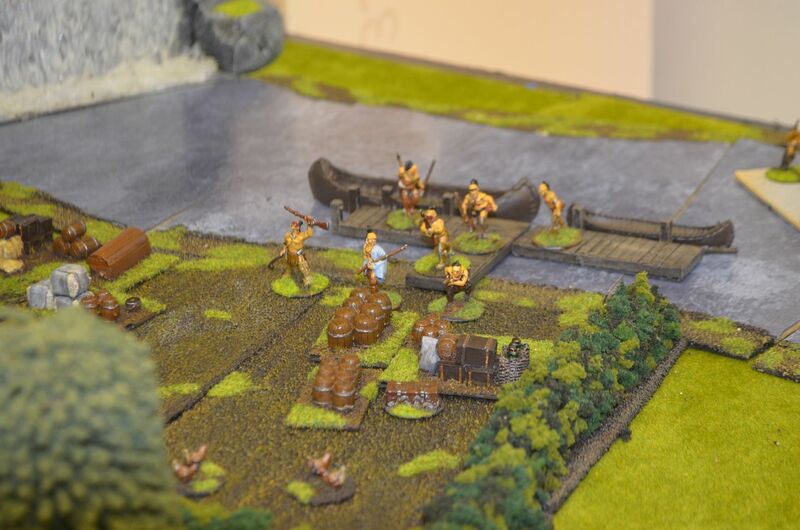 With this in mind he has commanded his warband’s to strike fear in the settlers ranged along the blue river, pillage and plunder are the order of the day. 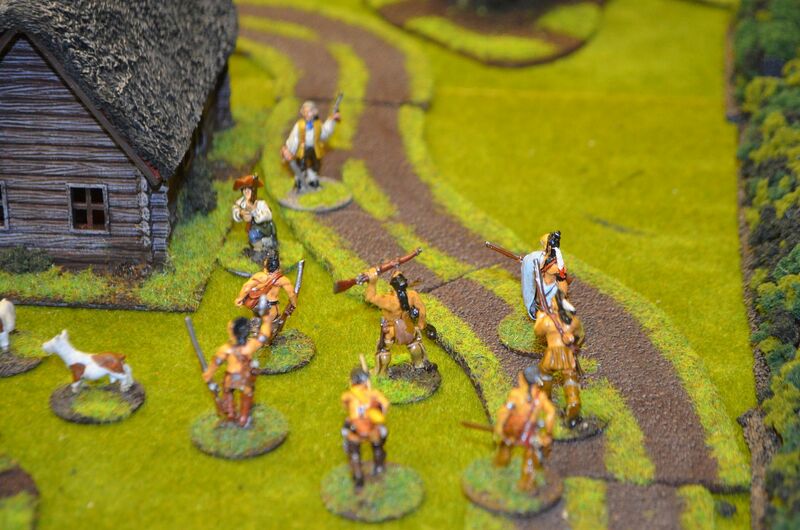 Each player commands a warband of 18 native Indians plus a chief. 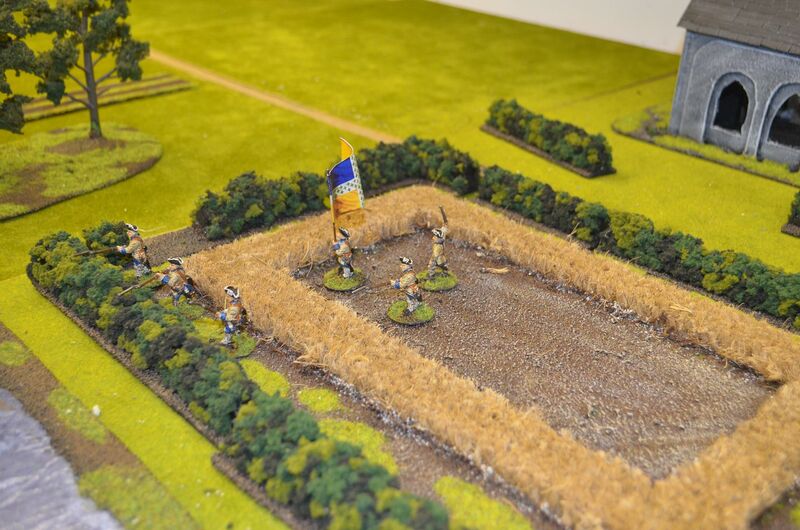 This is a competition game for every scalp and point of plunder secured by the warband they get points to their esteem, the player that secures the largest number of scalps and secured plunder becomes the next chief. Across the blue River lies the settlement of Parsons Crossing. 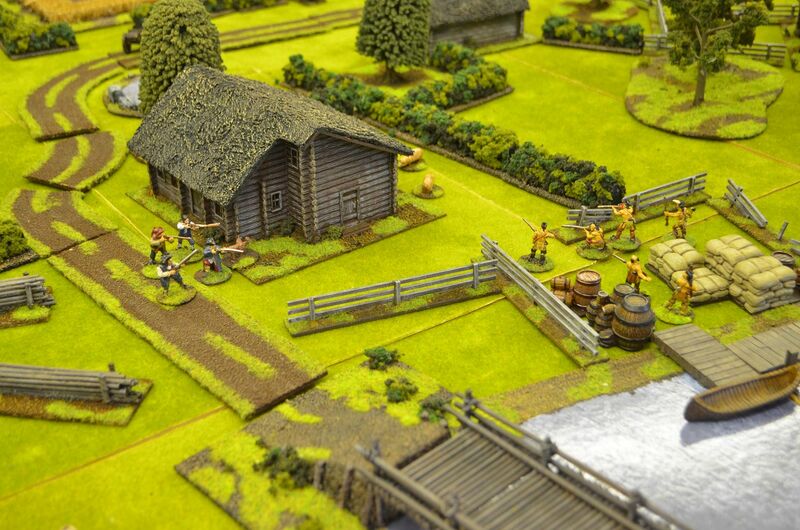 The settlement consists of several dwellings and farmsteads scattered along the river shore. To the South Lies Fort Edward, a place of safety and refuge. Each dwelling has inside a card, these cards denote the inhabitants raging from old Ma Parker (an aged civilian) to a bunch of tough trappers (irregulars). 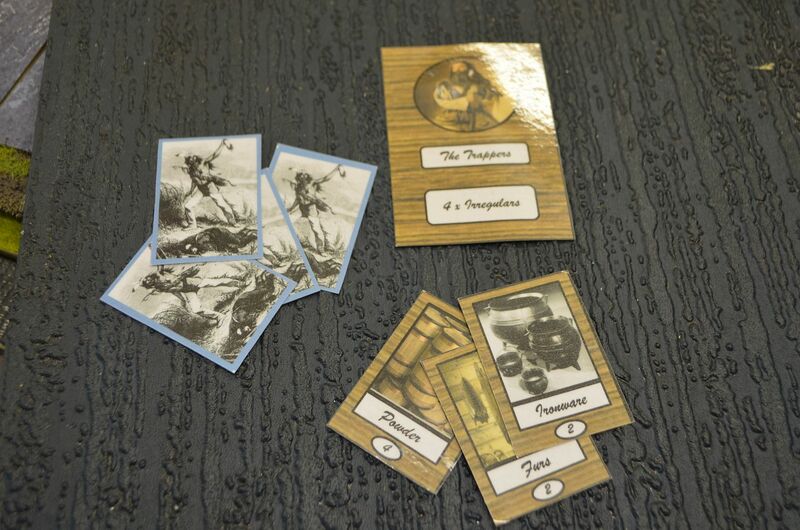 In addition to the inhabitants there are two plunder cards – placed at random from the deck. 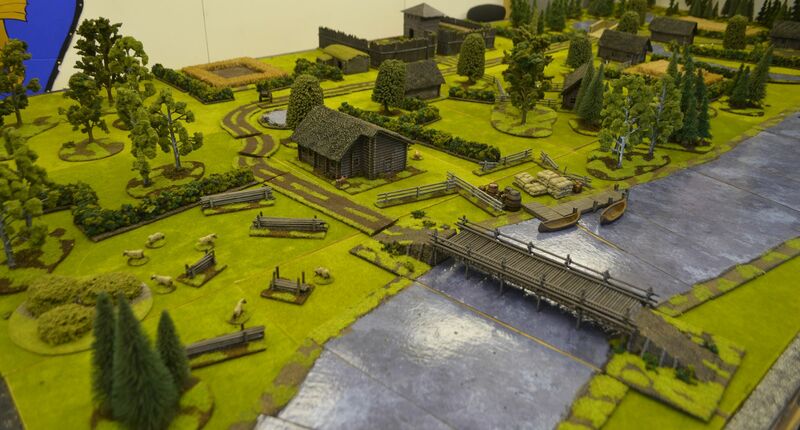 Furthermore there are several other ‘plunder zones’ marked on the table – white counters. 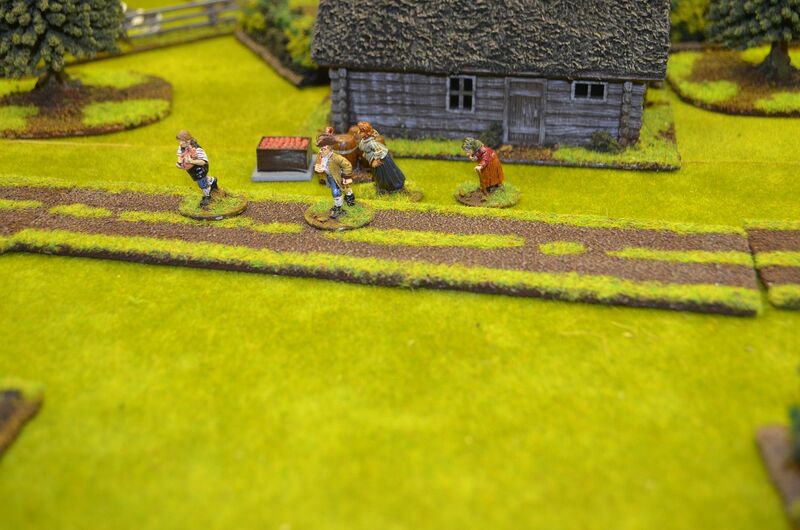 The plunder ranges from pelts to gold each worth a number of points (1-5). A single figure may carry one plunder card. As Indians die the player must decide if he has an excess of cards versus figures which cards are carried and which are disposed of (left behind for others to retrieve). Some of these cards carry no plunder but this is not revealed til the end. For every settler or soldier killed the Indians also collect Scalp cards. Each is worth one point in the grand tally. 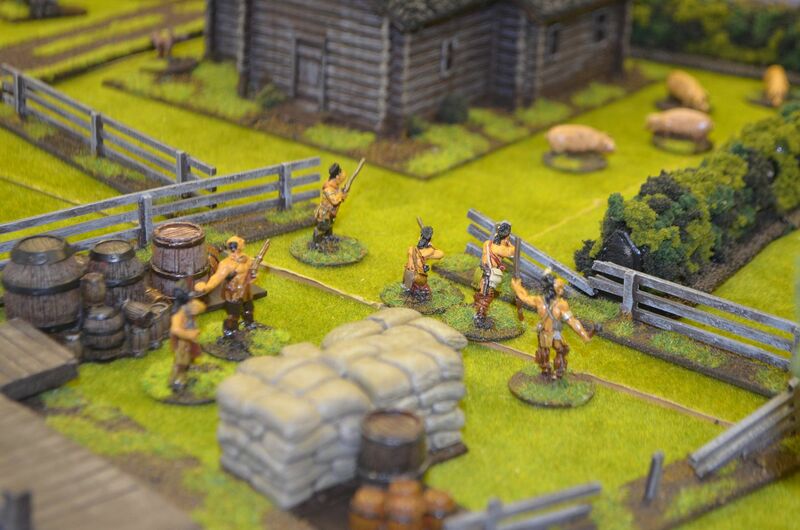 The Settlers mission is to survive, they may try and run for the fort (but will always get caught) or can they hold out until the forts garrison arrives to save the day. 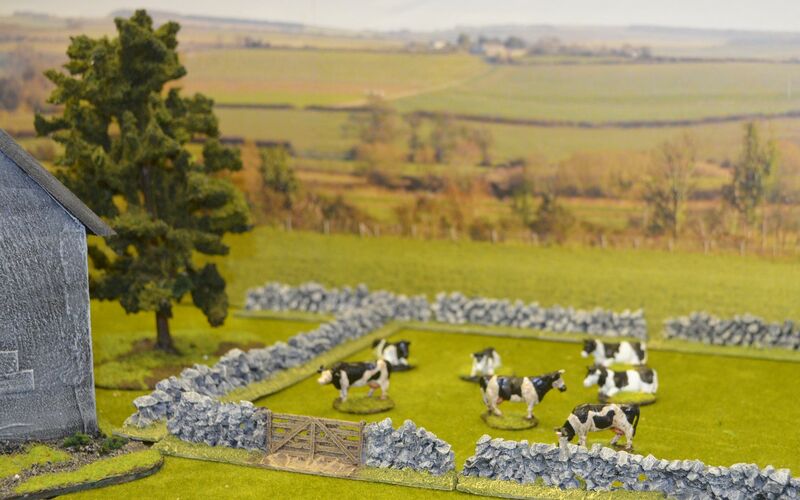 Having just completed my hedgerows I decided that a few fields would be nice on my table. 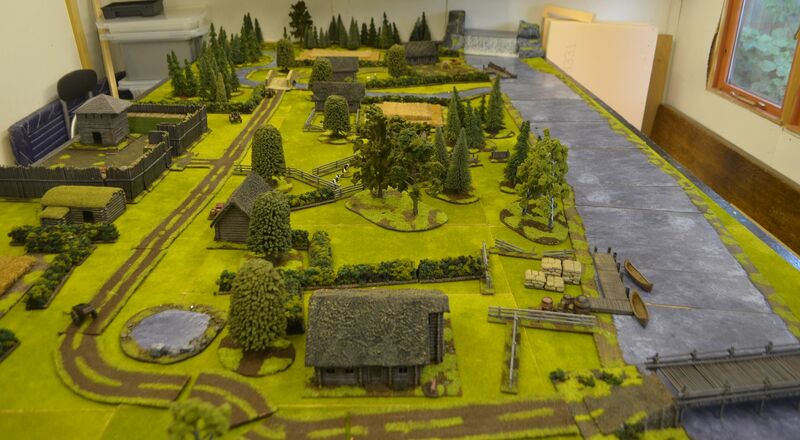 The following is a quick snapshot of how mine were constructed. 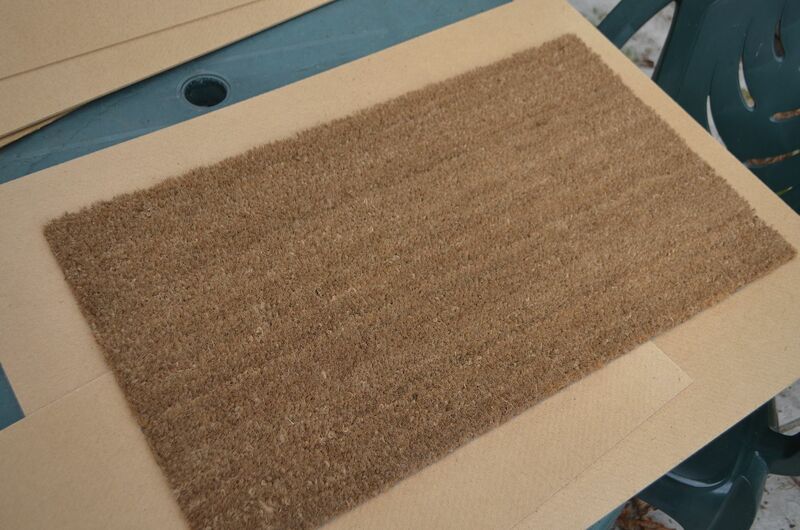 Secure one coir doorstep mat - mine was sourced from B&Q for a fiver. 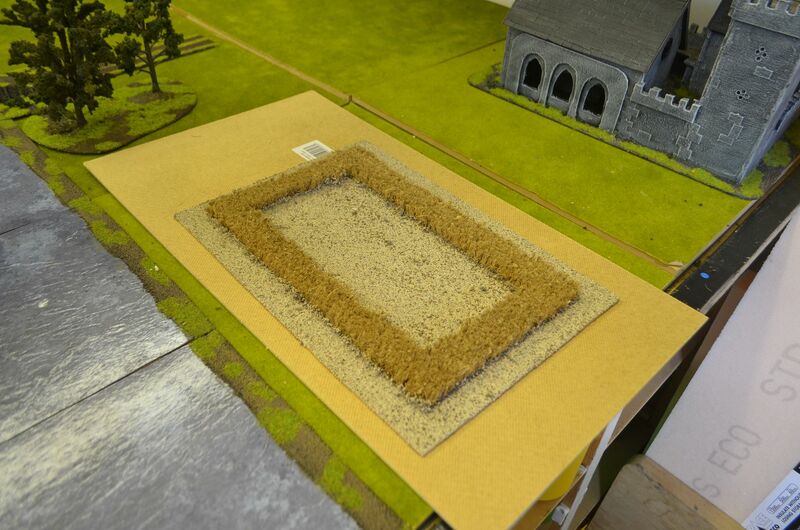 Mark up the mat with the shape of the fields on the underside of the mat. 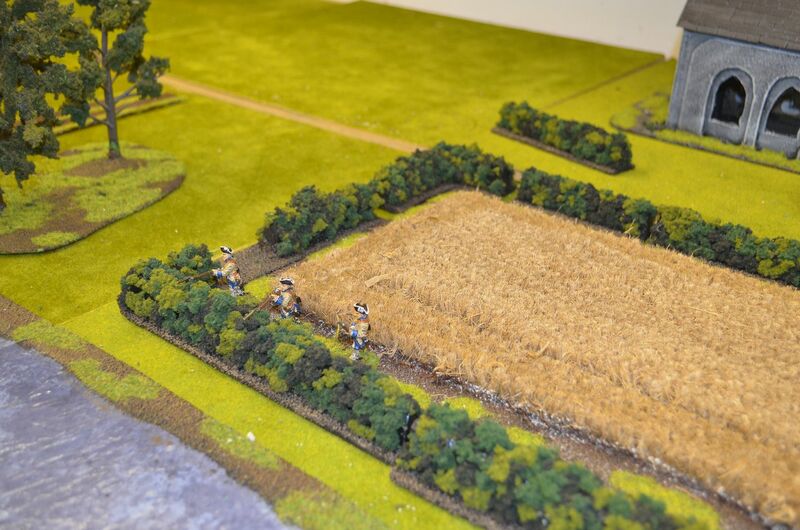 Using a sharp blade cut out the fields and an inside square. 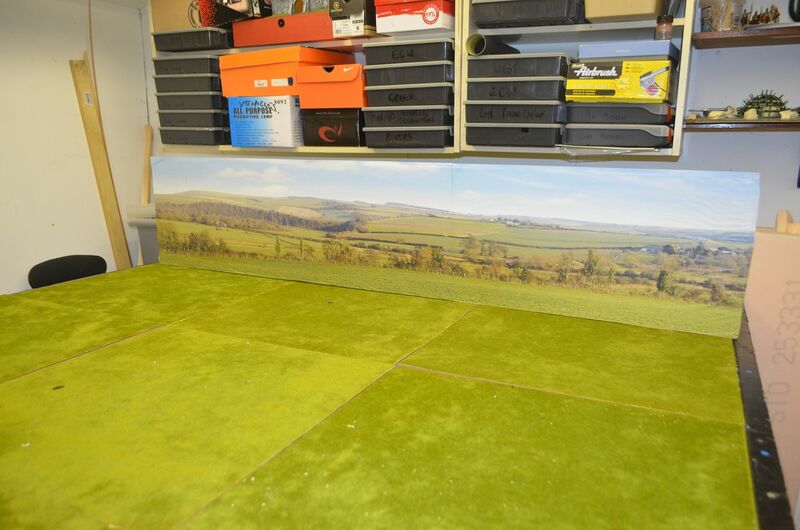 Glue the field perimeter to a hardboard base. 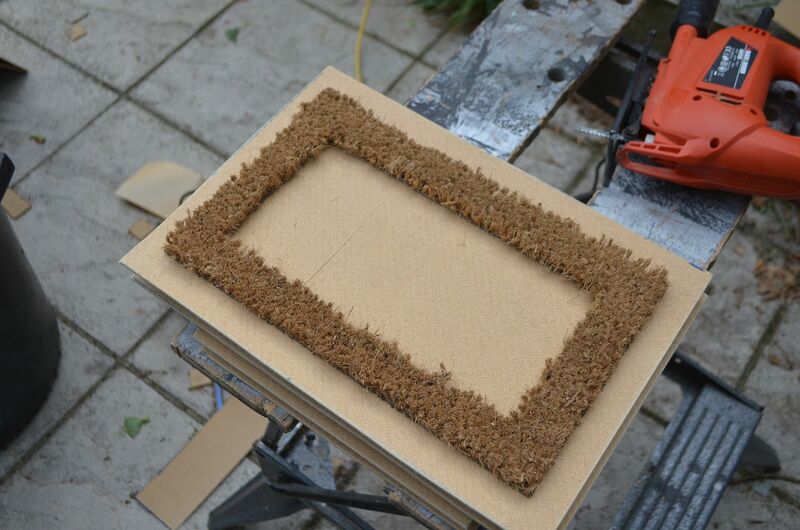 Once dry, coat the base in PVA and add sand, grit and ballast. Texture to taste. Allow to dry. Then paint base - mine painted with acrylic raw umber. Allow to dry. 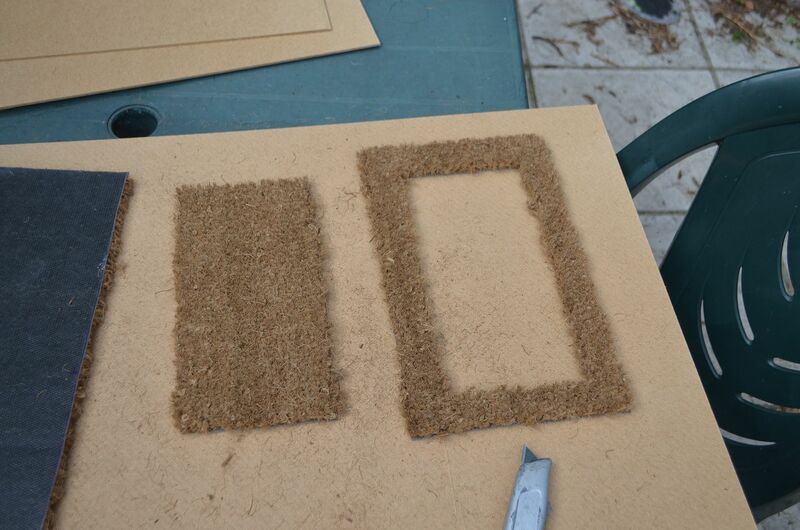 Once dry dry brush soil with lighter browns.Add static grass. Sorry no photo here. It speeds up the process if you make more than one at a time. I made four. Here are the other three. 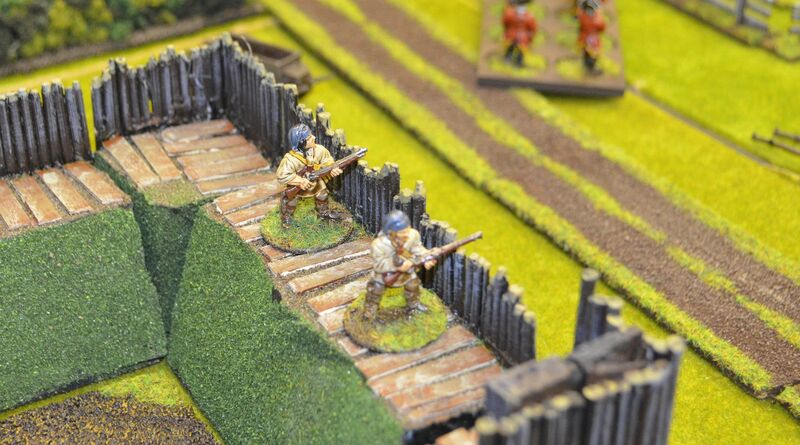 Note the Inner cutout can be used to fill the field or removed to allow troop deployment. 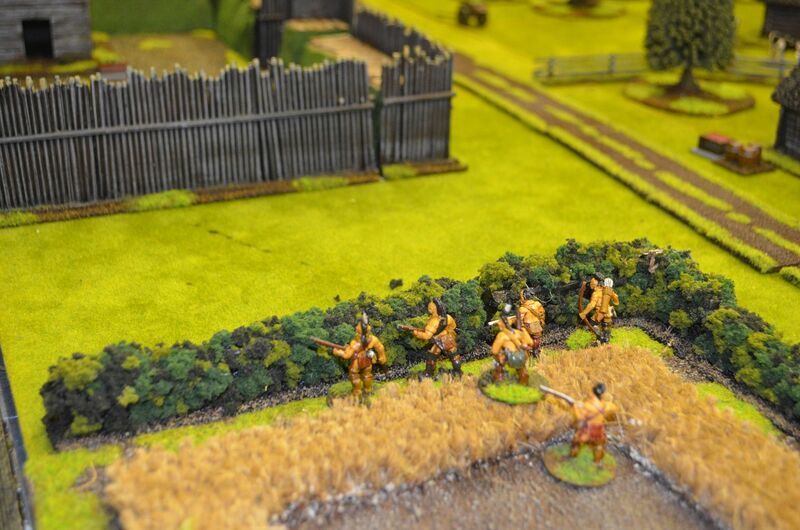 The gap around the perimeter allows troops to defend hedgerows etc. 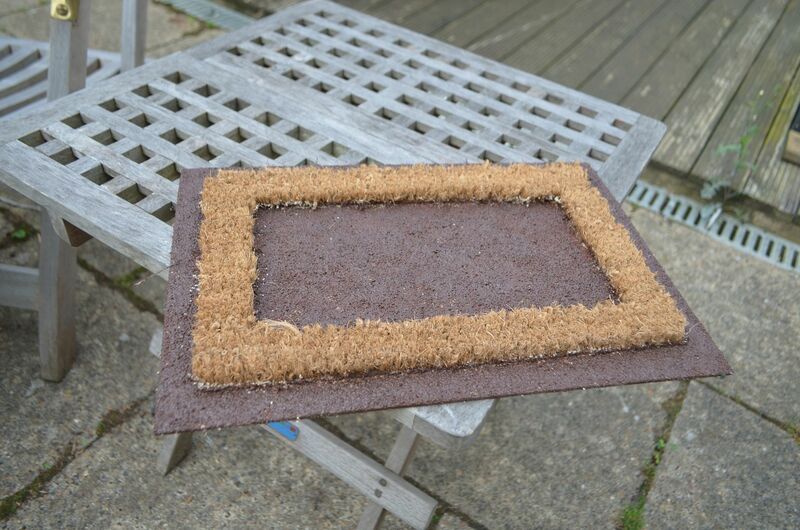 By not having fixed hedges on the field base I can now cater for a range of different perimeters. 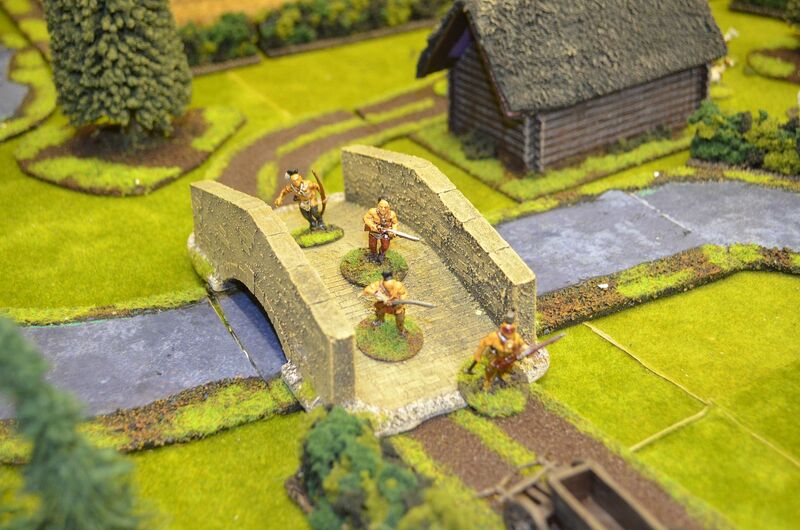 However Rivers need crossings and where my small stone bridges are adequate for crossing my smaller width waterways I needed something more substantial for the wider streams. So with a bucketful of bamboo skewers left over from my French Indian Wars fort I decided to knock up a simple wooden. 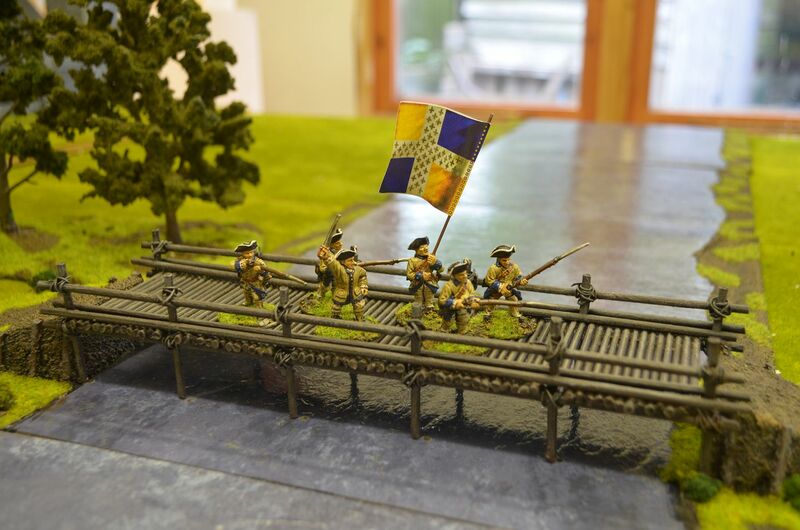 Of course these types of bridges are suitable for all genres and will no doubt be making an appearance in many other games. 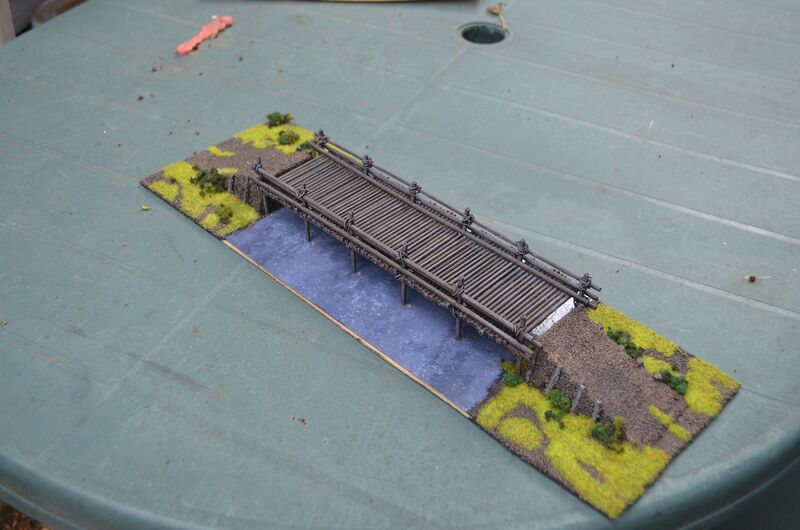 First up I built another river section that would act as the base for the bridge. 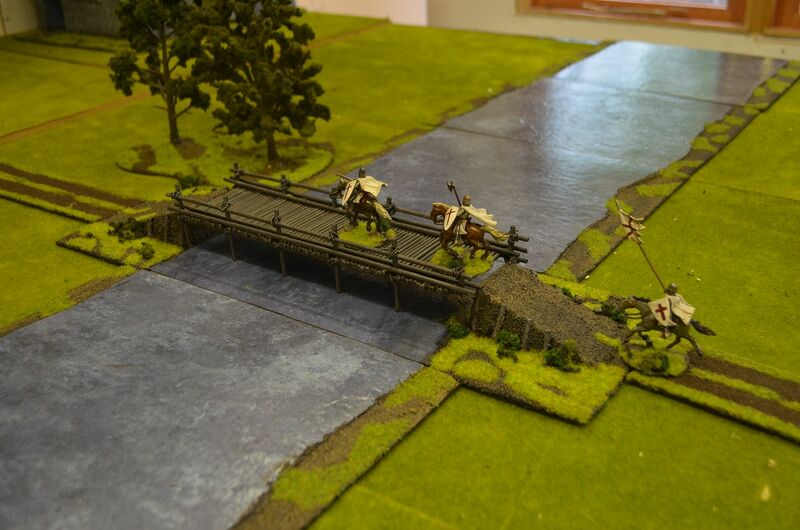 By having the bridge fixed to the board I would ensure that the construction would be as solid as possible. 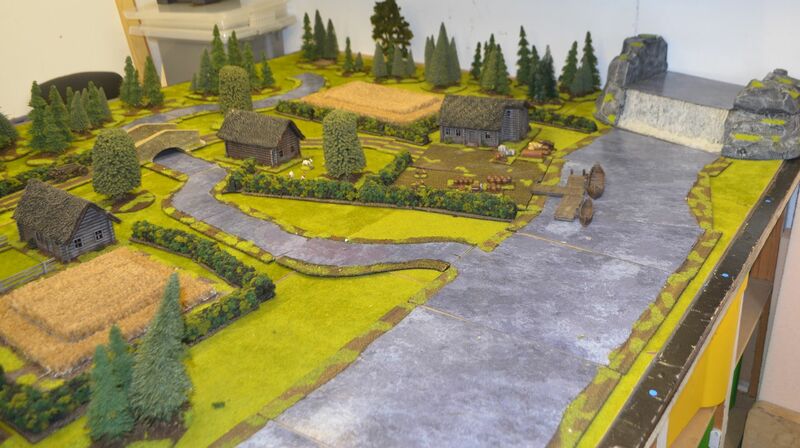 On the reverse side I then market out where the river posts would emanate from the water. 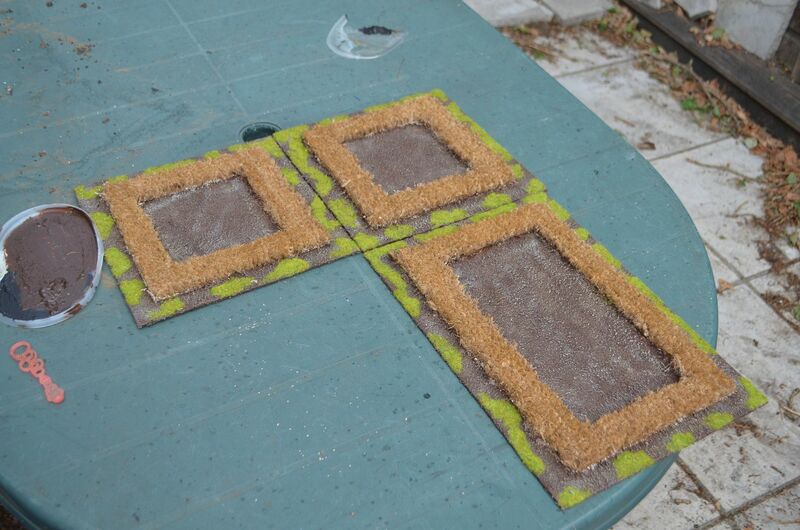 Holes were then drilled from the reverse side through the board and the water tile. Through these holes I pushed the supporting posts (skewers). The length of the poles were about 10 cm in length. They get trimmed once the superstructure is in place. 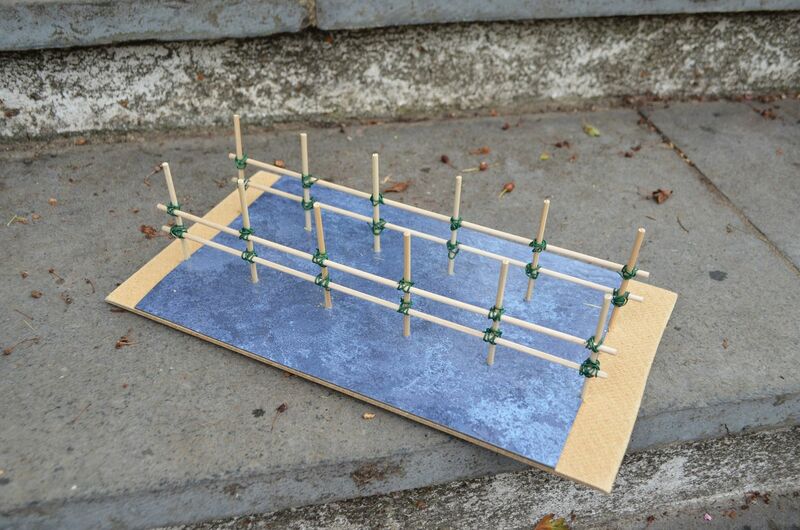 The next step was to secure the cross spars – again using bamboo skewers I tied these on using garden wire (the same stuff I used for wattle fences), Once tied a blob of super glue was dabbed on top. Once the cross spars were in place I glued a the bridge surface into place (cut skewers to required length) and then overlayed these with another cross spar. Realising that the painting of the underside would be near impossible I pulled (gently) the bridge off the base board and covered the whole thing in black matt acrylic. Its at this point I realised the ramps would need construction. So the baseboard would need to be wider to accommodate these. Putting my original board to one side (more on this shortly as nothing will go to waste), I cut out a new hardboard base and repeated the first step using the original board as a master. The ramps themselves are pink foam cut on the hot foam factory jig. 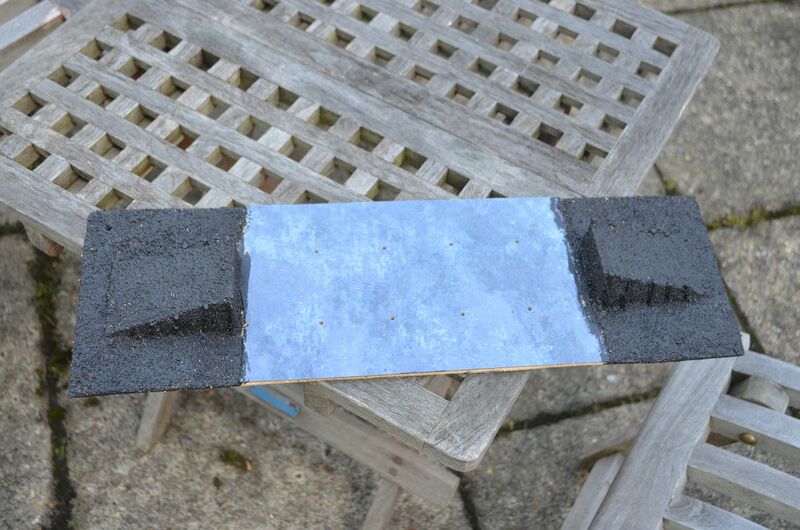 The resulting triangles are then fixed using PVA to the boards. To illustrate the man made nature of these ramps some wooden poles have been affixed to the side. 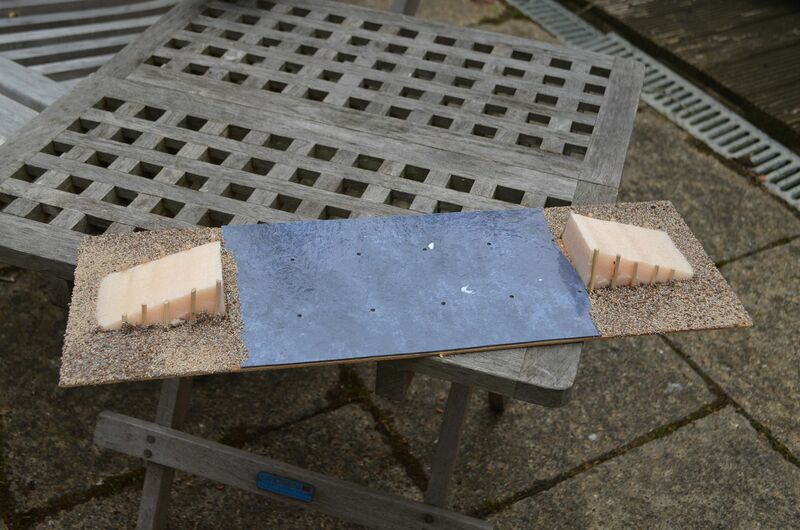 The ground areas on the boards and ramps are then covered in ballast, grit and sand using PVA glue. A top coat of black acrylic paint helps to fix this material in place. Almost there. 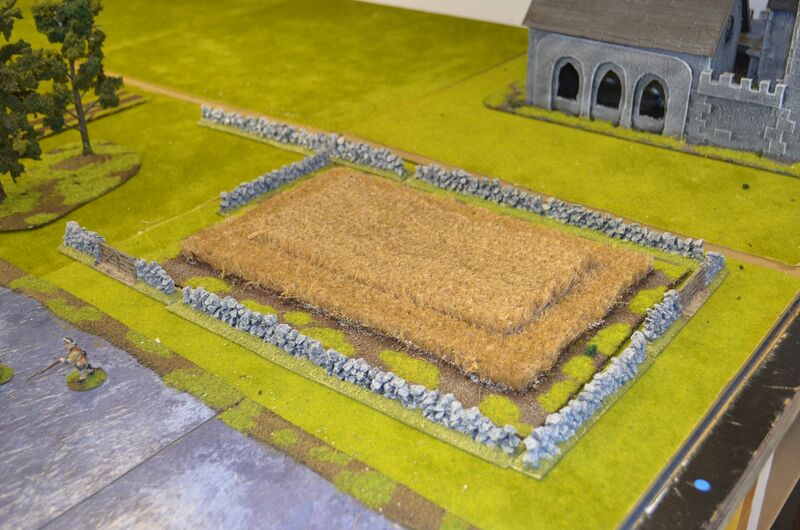 The ground areas are then dry brushed browns and liberally covered in static grass. 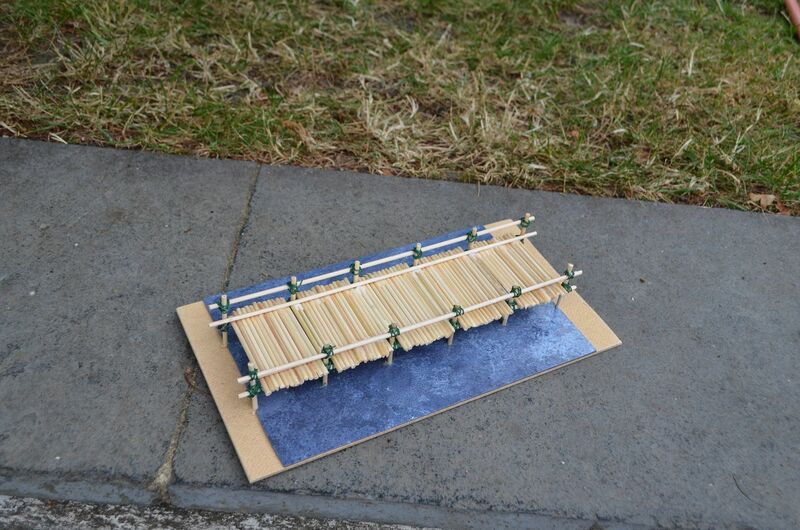 The ramps themselves are also painted but with less grass (afterall they see the wear and tear). 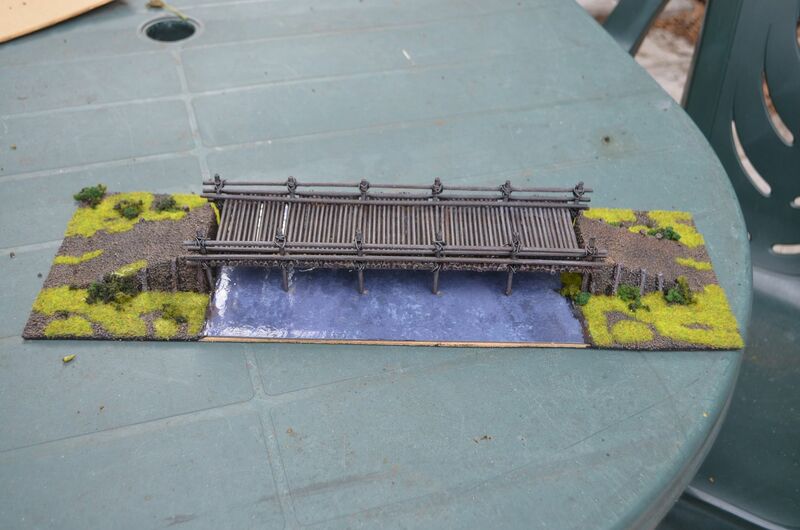 Finally the bridge is finished off in browns and greys. 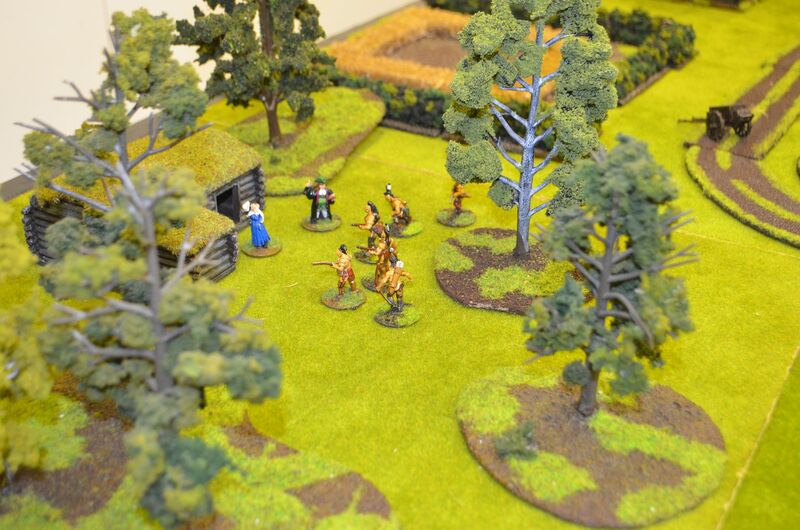 Static grass and clump foliage finish the scene.